Analysis of FPDs to be treated: partner Ecointegra has already classified the different types of flat panel displays available to be processed and has defined the components of each of them and the weight% of each disassembled fraction: Plastics: (16-23%), metals: (12-29%), loudspeakers and cables: (1-4%), circuits: (5-9%), LCD panel: (10-16%), display module: (33-43%). Lurederra has also accomplished some initial analysis to complete the work done by Ecointegra. In fact, the Centre worked on defining the content on the specific metals, quality, etc. Ecointegra has carried out the design of the logistics and points of collection of the flat screens for its recycling. Currently, it has renewed agreements with three large integrated management systems (SIGs), two of which have greater responsibility in the WEEE fraction. In addition, in May 2016, Ecointegra signed a new agreement with a major French SIGs. 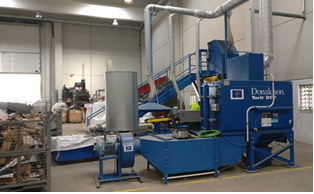 The mechanical processing line is installed into the facilities of Ecointegra. The line is composed of 2 Modules: Module I, where a manual disassembly of the simplest components is carried out, and Module II, where it is automatically processed the rest of the screen that has not been disassembled in Module I through two stages: (1) size reduction, mercury removal and sieving, and (2) magnetic separation. 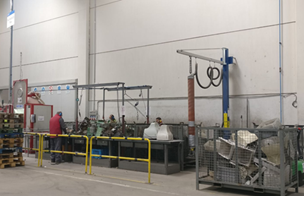 After carrying out the recycling tests for the verification of the performance of the pilot line, the line validation is reached at a semi-industrial level, and it is verified that it has a processing capacity of more than 200 kg / h of discarded flat screens. From the processing of these screens we get around 80% of fractions such as iron, aluminum or recyclable plastics by traditional methods, 13% of LCD panels from which later extract Indium, and 2% of glass powder from which later extract Yttrium. 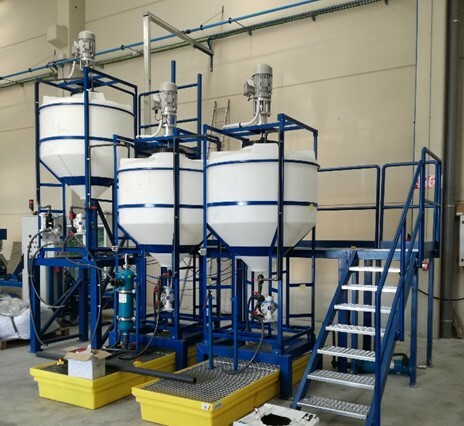 In the facilities of the L’Urederra Technological Centre the chemical treatment line has been installed, from where the key metals (In, Y) are being extracted. The line consists of 2 successive phases: Phase I where it is carried out the crushing of the LCD panels obtained in the mechanical line, and Phase II where the chemical processing takes place with the leaching and extraction of the target metals (from the fractions of the crushed LCD panels obtained in the first stage of this line and from the glass powder obtained directly from the mechanical processing line). Demonstration trials of the chemical line for the recovery of target metals (Indium (In) and Yttrium (Y)) are currently being carried out. The objective of recycling tests is to obtain 1.5 kg of In and 3 kg of Y from the waste of the flat screens treated during the project.